Updated 08/27/2011: Several months ago PureSmoker stopped carrying most of the Ace parts. I’ve had a good experience purchasing from them so I switched over to the Joy eGO model, which actually works better than the Ace though it’s a larger size. I’ve included new details in another post. 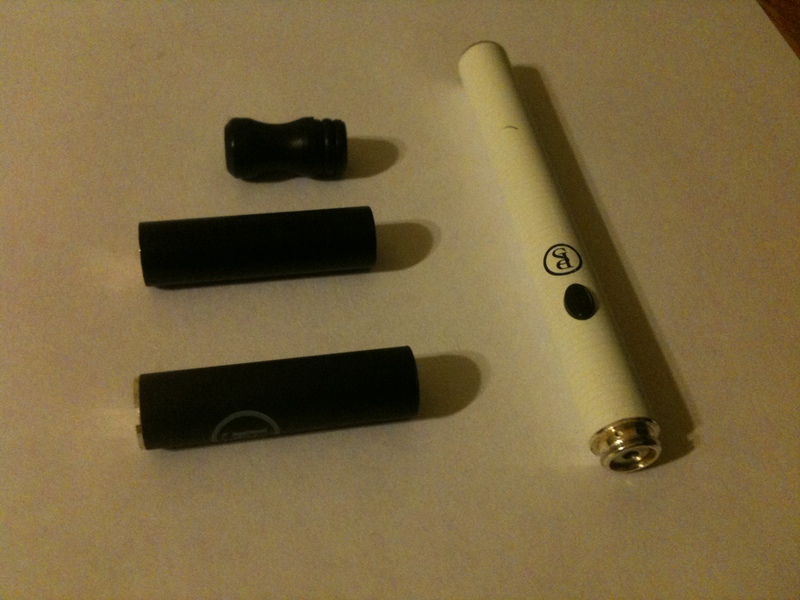 I’ve been using an electronic cigarette (eCig) off-and-on for nearly two years. At one point I went six months without a “real” cigarette. I’ve gone back to using them again and this time it’s sticking better now that I’ve discovered better brands/suppliers. I’m not going to get into the details of how an eCig works or what a cartomizer or atomizer is. There are plenty of other sites that explain these in better detail. My first eCig was an NJOY NPRO. The original starter kits, which included two batteries, at least one atomizer, five cartridges, and a charging set, cost about $80. A pack of ten cartridges cost $20. Each cartridge was marketed as being the equivalent of a pack of cigarettes, but in my experience that was never the case. I stuck with the brand for a long time and by the time I stopped using NJOY products I purchased two starter kits, bought a used one from a friend, and purchased at least four more express kits ($35 each with fewer pieces). I don’t even know how much I spent on cartridge packs. I had learned to save money by purchasing “smoke juice” (the liquid included in cartridges) and refilling my own. I also started buying blank cartridges and filled those myself. I also started buy atomizers from another company, which saved some money. Eventually, I was even able to buy third-party “cartomizers”. However, in the end, the high rate of failure (off all parts) and the cost was too much to deal with. Last spring I wanted to find a product that worked better. After doing some research I figured out that part of the problem with the batteries was that they were “open” in order for air to flow into a sensor that cut off power from the battery after one stops inhaling, which allowed juice to seep into the battery itself. I searched but wasn’t able to find a “manual” battery (one that is closed and uses a switch to turn it on as opposed to the sensor). During my search I stumbled across a different eCig model (Ace, KR808D-1) at Pure Smoker. The starter kit was only $30 and included two batteries and one charging kit. Cartomizers and atomizers were not included but both were available. I’ve stuck with Pure Smoker ever since and I’ve been very happy with the cost and quality of products. It was several months before I had a part fail and so far I’ve only lost a couple of (inexpensive) USB battery chargers. I am also impressed that Pure Smoker clearly displays the model types for their devices. Many eCig distributors hide this fact – probably to convince visitors that their the only source for parts for those brands. The forums at Pure Smoker are an excellent source for learning how others use their devices. I use both atomizers and cartomizers with my Ace batteries. If you want to order an atomizer for the Ace from Pure Smoker then you’ll need to choose the DSE901 “Mini” Atomizer. Below is a list of my current eCig inventory, including a couple of items I purchase from other suppliers. 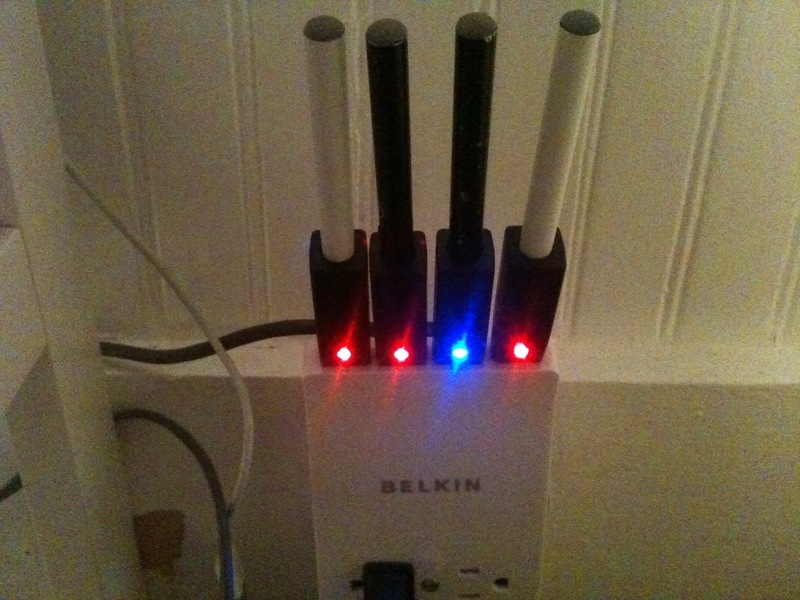 The chargers glow red while charging but about every 10 seconds it will flash blue. In a dark room at night this can be distracting so I cover the LEDs with black electrical tape and then uncover the LEDs in the morning when I wake up. Recently I had a couple of USB chargers die but I didn’t need the wall charger so I ordered only the USB chargers from the site listed above.